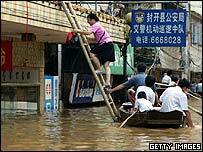 Summer floods in China have killed 567 people and forced over two million from their homes, the government has said. Torrential rains in much of the country have left areas of southern China submerged beneath muddy waters in the deadliest early floods for a decade. Heavy rains have come sooner than usual, leaving the city of Wuzhou, and the provinces of Guangxi and Guangdong seriously affected. President Hu Jintao has ordered officials to increase emergency relief. "Faced with a serious fight against the floods... we must quickly step up efforts at organising construction and inspections of major dykes, reservoirs and reserve flood areas," he said at a flood prevention meeting, quoted by People's Daily newspaper. Officials have warned of the spread of cholera and other intestinal diseases. The Chinese Health Ministry said, quoted by China News Service, that nearly 3,400 cases of cholera, dysentery and typhoid fever had been recorded in the first six months of the year, and that the figure was still rising. The worst flooding in recent years was in 1998, when 4,150 people died. Rivers have burst their banks and mudslides have contributed to the death toll in the south, where 124 people died in the past week, Chinese state media said. Chinese officials expressed concern that the floods have yet to peak. Some 2.45 million people have been evacuated from their homes, officials said. In Wuzhou, a city of 300,000 people, residents were forced to construct makeshift boats and rafts as flood water approached the upper floors of houses. Meanwhile water levels reached their highest in at least 90 years in the Pearl River, which flows past the regional business centre Guangdong. Much of China is hit by floods every year, often spreading quickly because of deforested hillsides that trigger landslides and do not prevent flood waters from building up. The floods, which have come early in the annual wet season, have caused an estimated 22.9bn yuan ($2.77bn) worth of damage, reports say. Hong Kong was hit by heavy rains on Friday, causing traffic delays. Services on the main rail line from Hong Kong to China were suspended after a landslide. The situation in the south contrasted with soaring temperatures in central and northern regions. The central province of Anhui is enduring a record drought, while a heat wave has persisted in the Chinese capital, Beijing. Yesterday was the worst flooding I have seen in my 8 years in Hong Kong, it was terrible whole streets were turned into rivers. Unfortunately I had a meeting to attend in Zhongshan (about 150km NW of HK), all the ferries were cancelled and we had to take the train to Guangzhou and then drive down to Zhongshan. The flooding was extensive although it seemed business as usual for most people. My return journey to HK took 6 hrs as opposed to the normal 1.5 hrs due to severe flooding around the Zuhai area. All of the rivers in Pearl River Delta are very swollen and moving rapidly. They forecast more rain for the next few days and I have another meeting coming Tuesday across the border! Never have I seen anything like this in Hong Kong. Some roads flowed like a rapid river. You can even see emergency ambulances breaking down on the streets because of the flooding. Heavy rain continues to fall in Hong Kong and Southern China. Although Hong Kong's hilly terrain can deal with the storm water better than the surrounding low-lying plains of Southern China, many roads on Hong Kong island have been closed today as normally dry water courses have erupted into spectacular waterfalls, breaking retaining walls and depositing rubble, sand and mud across roads - even flowing into the ground floor entrances of apartments. There was a brief respite this afternoon when the sun shone for a while but it is back to thundery showers again now. The weather forecast predicts no let up until next Thursday at least.